I said I wouldn’t overdo it this Christmas. You know, with the whole knitting thing. Last Christmas I made myself a little crazy and I swore I wasn’t going to do that to myself this year. It all started with my husband’s Christmas hat. He gets a new one every year. I’m hoping this is going to be our “thing.” When he’s 80 he’s going to have a mountain of hats. He has this habit of not losing things. At some point, that may become a problem. Maybe senility will kick in and help us out with the hat problem. Anyway, it started out with my husband’s Christmas hat. Then I knitted a couple more because I had some scrap yarn in my stash that was just right for hats. Then I decided to knit a hat for my niece. I knitted that hat like I was a jazz musician. Total improv cables. It turned out great. Then I realized my new little nephew needed a hat too, so I cast one on. He may need multiple hats. Babies lose hats all the time, right? This is a troubling hat trend. You may have created a monster. Oops. But it’s made of woolly hats, so it’s a cuddly monster. I’ve heard others say similar things about socks. Socks aren’t grabbing me these days, but one of these times I’m sure they will. Not troubling at all. Awesome. Hats are awesome. Well, I went for shawls…I think hats are a much better bet! I started knitting some hats and then posted them on FB and then the requests came pouring in. Now I am trying to resolve to say NO to the next request! 2 more to go when I get the latest one done and I am calling it time to start working on the 3 cowls I need for Christmas!! No, if you’re starting a tradition, keeping it simple and achievable is good! I like the “smalls,” too. Hats, mittens, socks – quick and warm and cozy. Troubling, yet so satisfying! Most of my xmas knitting is a series of hats and cowls. I’m trying not to do it this year, but I know I’m going to cast a few on regardless. Especially since my husband, unlike yours, is adept at losing knitwear. Sigh. That is how Christmas knitting is multiplying around my house. 🙂 Every time my husband comes home I am casting on something else and he gives me the eye roll…with a mischievous smile. Fox themed knits are definitely a thing right now. There’s a wonderful foxy hood on Rav right now. I’ve been thinking of knitting it for my niece…and every other child I know. Hats are great projects. A night or three in front of the TV and bang! 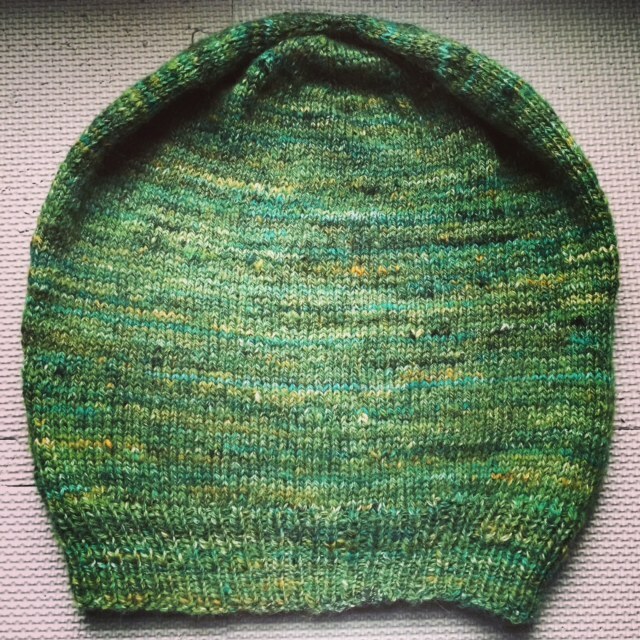 A hat is born! I love the idea of using them for swatching too. Somehow the word “swatching” seems to magically pull me in – even more when I find it on your blog 🙂 Were you serious? (That green is way too attractive to ignore any swatching suggestion …). Your handspun hat is very nice. Keep up the hat knitting. I am in a hat knitting and tube sock knitting binge right now. And for now, it seems a good place to be. I guess the good thing about a knitting binge is the productivity. Pretty much every other kind of jag.